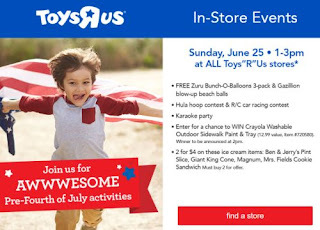 Free events for kids at Toys''R''Us! On Sunday June 25th, 2017. Free Zuru Bunch-O-Balloons & Gazillion blow up beach balls. Enter for a chance to win crayola Washable outdoor sidewalk paint & tray $12.99 value. Click the link below to get the details of this fun day!